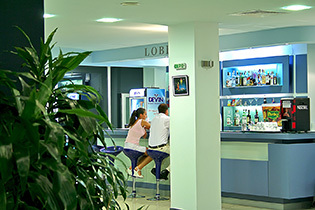 The lobby bar of Aqua Azur Hotel is located in the lobby. It is the ideal place to wait for dinner meeting, to talk to an important business partner or just to be in your privacy with a book and a drink. The atmosphere is fabulous and very relaxed and the two unique aquariumstherefore contribute mainly for it. Refreshing, soft and branded drinks are served both inside the lobby bar (capacity 50 seats), and the outdoor pool terrace.